Visitors at "the Art of Video Games" exhibit at the Smithsonian American Museum of Art. 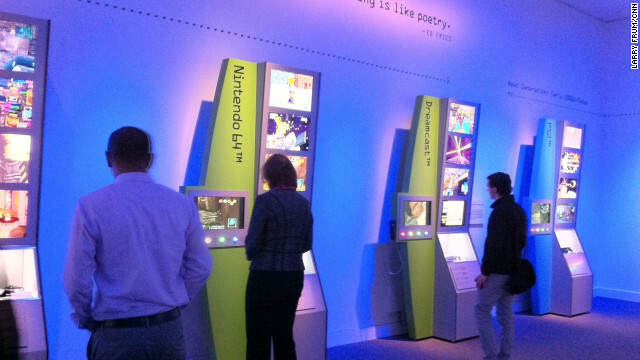 Bringing video games into an art museum would be considered an ambitious undertaking in years past, but visitors to the Smithsonian opening of “The Art of Video Games” say it isn’t surprising at all. The new exhibition explores 40 years of video games as art through interactive games people can actually play, pieces of gaming memorabilia and dynamic visual displays that highlight the artistic work done by developers. It is the first such exhibit to appear in a major museum, and visitors of all ages came away from its opening day with feelings of nostalgia. Groups of family members – parents and children, grandparents and grandkids – marveled at the exhibit, and each took away something different. Jimmy’s mother, Barbara, wasn’t surprised to see video games being represented in the Smithsonian American Art Museum. She doesn’t play, she said, but she has five kids who all played, and the exhibit's images reminded her of times when her children were young. Some people thought recognition of video games as art was overdue. Brian, a 19-year-old from Pittsburgh who has designed some personal video games, thought “The Art of Video Games” exhibit is a good first step for the Smithsonian but said there needed to be more. His father, John, agreed and said he was a little disappointed the exhibit had such a narrow focus. Guest curator Chris Melissinos hopes people from across the U.S. come out to see what video games are and what they have become. Larry, it was great meeting you last Thursday! Great blog, and hope to see you at PAX East!